the conception of homes are a little different from what one can see elsewhere. most families in mali are extended families with up to three generations living together at times. to accomodate such large crowds, there are numerous houses-- sometimes just one or two bedroom only, sometimes a little bigger, rectangular in shape with a veranda -- all lined up in a circle, leaving a huge yard in the middle. they are called compounds. the yard is the heart of the home, as everything takes place there: dishes, laundry, cooking, chatting, childrearing, etc. while it is very rare, if not impossible to see husbands and wives holding hands or kissing or having any other gestures of tenderness for one another in the middle of the compound (or any other public place for that matter), it is not uncommon to see women nursing their children right in the middle of the yard. that may happen any time of the day or night, whether other family members are present, or outside visitors happen to drop by. There is no taboo about a woman's breasts being seen as she nurses her baby. breastfeeding is considered to be a natural thing. 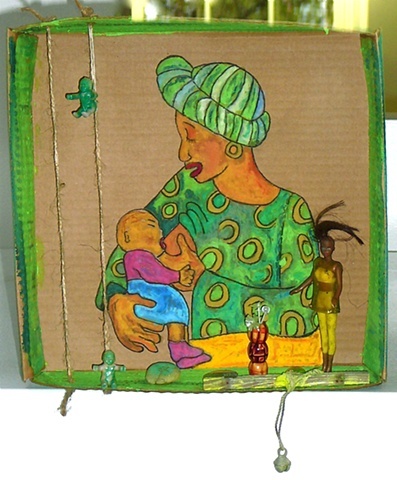 For that reason, women can be seen nursing their children virtually anywhere: on public transportation if the child happens to be crying, at the marketplace, or at any of the numerous ceremonies that abound in the society (e.g., naming ceremonies for newborn babies, engagement ceremonies, weddings, funerals, etc.). it is the acceptable thing to do. in fact, any woman who would let her child cry and not try to calm her/him down with breastfeeding first is sure to attract criticism from everyone around, strangers and acquaintances alike. in the mid-sixties and seventies, this practice changed somehow for the so-called "intellectual" women. that was when the western trend of baby formula was gaining momentum in african countries. In mali, they had the "Guigoz" brand from france. needless to say it was not cheap. It became fashionable to carry baby bottles around and not expose breasts in public anymore. however this practice was in big cities mostly, and only by relatively well-to-do women who had had some schooling. the majority of women who lived in rural areas, and who, for the most part, could not afford the baby formula kept up the old ways. the "intellectual" women may have taken up the baby formula practice first because it was around the time when women were going out on the job market, working in offices in salaried positions. in fact, there lay some of the problems with the baby bottle: these working women had to leave their babies with either their mother, mother-in-law or maids, all illiterate, to handle the whole bottle feeding process. hygiene standards were not the highest possible, to say the least. the second reason may have been due to the huge advertisement campaign for baby formula and against breastfeeding put out by western companies. the last reason may be because of that desire to be like western women. luckily the fad was long gone. breastfeeding, if the mother is able to, can be the greatest bonding process between mother and child. it is a peaceful, soothing, and priceless moment for both mother and child, not to mention that the mother's milk is far more superior to any formula when it comes to its nutritional value for the baby. the real deal is always much better than any substitute. That probably explains why most malian children do not use pacifiers. Wow! You're very creative and artistic. Superb humanistic piece, Jennifer !!! Bravo! Having breast-fed each of my three children for over a year I can only confirm your last paragraph. Beautiful piece. Still love it! It's good to see it again! love simplicity of this image. And the underlying philosophy.